Yesterday my girlfriend used my iPad and after too many passcode attempts she got a iPad is disabled connect to iTunes message. My iPad was totally disabled and unusable. 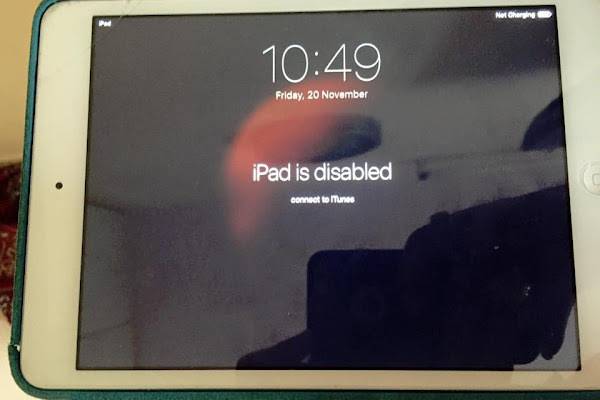 She tried too many times and now iPad says only: "iPad is disabled Connect to iTunes" When I connect my iPad to iTunes it shows that it's locked with a passcode. And I can't access it. I also tried to connect it on my laptop, because I made a backup few months before, but no success. I also opened my iPad and disconnected the battery. But after that, it still show the iPad is disabled screen. No success. No luck. I have a lot of data in my iPad, and my backup is before a 3-4 months. Is there any way to fix my iPad without iTunes restore? Or I must to restore it via iTunes? Please help me to fix my problem. You do not need to open your iPad. This is not recommended. But the good think is that you can recover you device, but the data can't be recovered if you don't have a backup. I recommend you to login to your iCloud account and see if you have created a backup from your iPad. This will help you to recover your data. Put your iPad in DFU Mode (Power Off -> Hold home & power for 10 seconds -> now release power, but keep holding the home button. iTunes will detect your iPad in recovery Mode. Just click Restore and the restore process will start. After the process is completed, your iPad will be recovered. This is the best solution if your iPad is disabled. Please make sure that you know your iCloud id & password before you start the process. Because if the iCloud Activation is activated, you will need to enter your id and password to activate your iPad. Go to the apple phone store and let the figure it out.